Hodgson Russ was an official “Full House Sponsor” for Habitat for Humanity Buffalo. Habitat Buffalo builds and rehabs 10 to 15 houses per year. Approximately two-thirds of all Habitat Buffalo homes are rehabbed houses, and one-third of homes are new-builds. At this level of sponsorship, our donation went directly to pay for the materials, construction and other costs related to building a new home from the ground up for a low-income family. On March 27, 2018, the Habitat for Humanity construction crews broke ground at the site where our sponsorship home was built with, and for, a family deserving a “hand up”. 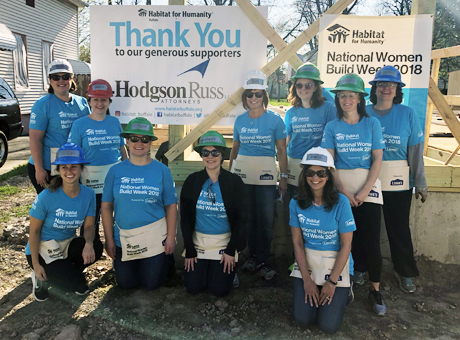 On May 8, 2018, a group of Hodgson Russ attorneys and clients proudly participated in the Habitat for Humanity Women Build Week event. National Women Build Week is held the week leading up to Mother’s Day, with Lowe’s generously donating nearly $2 million dollars and volunteer support. Hosting the event during that week reinforced the message that every woman can make a difference through learning and using construction skills. 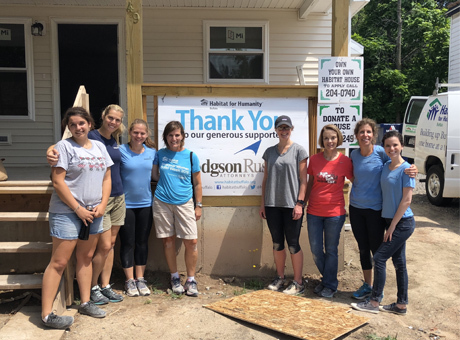 The Hodgson Russ Women Build Team was the first to work on the Firm's sponsored home. In July, a team of our staff worked on the house which included installing drywall inside. Jody Galvin, pictured here, participated during the Women Build Week and was spoke on behalf of the firm at the Habitat for Humanity Dedication. In August, the construction of the Hodgson Russ Habitat for Humanity house neared its end. Volunteers, pictured here, participated in one of the last days of the build. A huge thanks to everyone who assisted in building this house for a family in need! 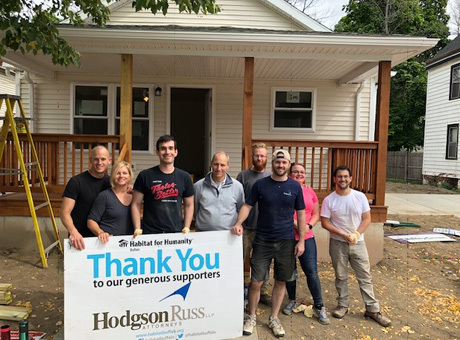 Various Hodgson Russ Litigation Practice attorneys including Stephen Kilkenberg, Peter Wiltenburg, Michael Risman, Patrick Hines, and Nicholas Vozzo participated in one of the last builds day at the firm's sponsored Habitat for Humanity house. The group had a wonderful experience partaking in the build. On October 6, Jody Galvin spoke on behalf of the firm at the Habitat for Humanity Dedication and presented housewarming gifts with a group of volunteers. The Hodgson Russ sponsored house was donated to a local family and Buffalo's newest homeowners. 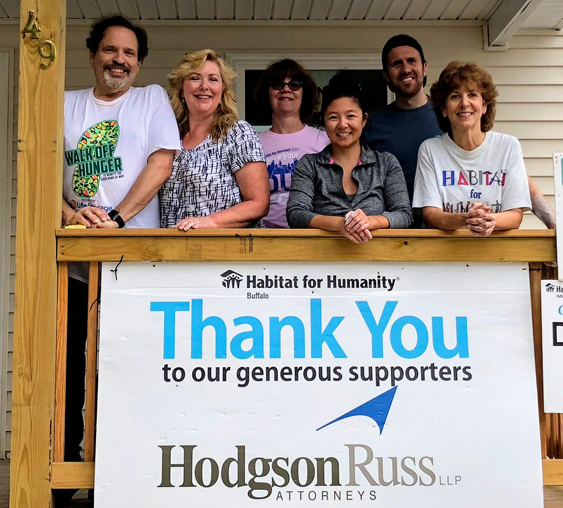 Hodgson Russ would like to thank all of the volunteers within the firm who dedicated their time and effort to help a family in need. Also, we wish to thank Habitat for Humanity including Angela and Theresa as they strive to improve Buffalo's community one house at a time. The Hodgson Russ sponsored house is the 307th house built and dedicated to a family needing a "hand up" since 1985.